Learn crochet and make new friends. 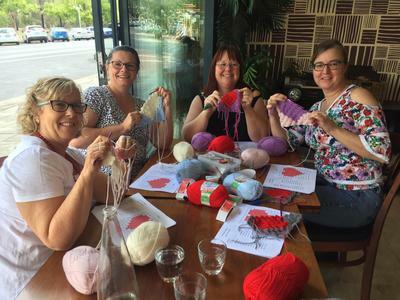 The Melbourne Crochet Club organises crochet classes run by Professional Crochet Instructors for beginners, all the way up to experienced crocheters. Loved the teacher, Tracy is amazing and would love to see more classes!! Great, my aim was to learn to read patterns, was successful. Hopefully a fabulous start! Lots of fun and got great results. Loved it Tracey was so helpful and friendly took the time to help each of us individually. Now i know how to make a grannt square! I thoroughly enjoyed the class. Excellent venue. Brilliant instructor. Could not fault the experience. Carolyn is so nice. I really felt comfortable! It was really helpful and enjoyable. A really enjoyable and relaxing afternoon. Jenny was clear, encouraging and helpful, and the booklet provided was very useful. It felt great to walk out having made something that was finished. it was really good to be able to have a small class and you could really ask and have answered any question you wanted. I had a really enjoyable experience. Despite it being a holiday weekend and the class being small, ( only one other person plus the tutor), we had great tuition and some very enjoyable chatter, plus I am now able to make a “granny square. Perfect! It catered to my needs. The location and Day are perfect as there was no parking restrictions on Sunday and it was early enough not to cause problems when people are dining at Hellenic Republic. Theee were 4 of us so it was a good friendly and intermit. A lovely morning out - am looking foward to the next one. We enjoyed the event and learnt some new skills, got ideas. Was worth doing.